Only use the cup holders for containers of the right size and which have lids. The drinks could otherwise spill. The stowage compartments in the doors provide space for bottles with a capacity of up to 34 fl. oz. (1.0 liter). The bottles are not secured or prevented from tipping over. Therefore, do not place any open drink containers in the stowage compartments. : slide cover ; to its foremost position. pull cover ; back as far as it will go. ■ To switch on the cooling function: press and hold button 3 until the blue indicator lamp on the button lights up. ■ To switch on the heating function: press and hold button 3 until the red indicator lamp on the button lights up. ■ To switch off the function: press and hold button 3 until the indicator lamp on the button goes out. When the heating function is used, the metal insert of the cup holder is heated. Once a certain temperature is reached, residual heat indicator lamp 2 lights up. This means that the metal insert of the cup holder is hot. For this reason, you must not reach into the cup holder metal insert. Do not use hard or sharp objects to clean the cup holder. Use only a soft cloth to clean it. Cup holder 1 is located in the rear seat armrest. 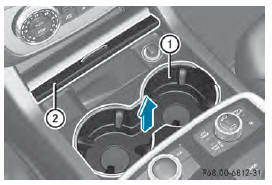 The cup holders are located in the side trim on the left and right-hand sides.